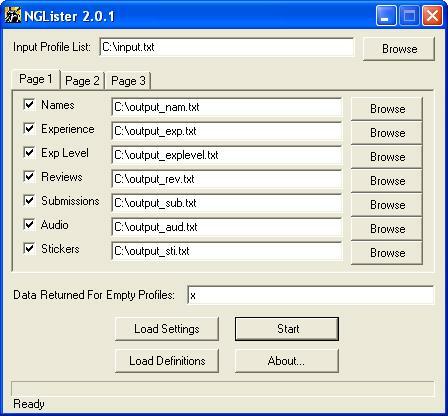 NGLister gathers data from Newgrounds profiles for making ranking lists. It can gather 19 different types of information, outputting each into a separate text file. Note: New in version 1.4 was a mandatory (free) registration, in order to limit the number of lists appearing on Newgrounds. Run the NGLRegRequest program in the ZIP file and send the reg request code (along with your NG username and request essay) to joshua70448@gmail.com.